The babybay Bedside Sleeper is a quality wood product that resembles a crib but attaches to the side of your bed. This design keeps baby close and provides easy access for nighttime feeding, soothing, and bonding. We love the design or this bassinet and feel the overall fit and finish is above compare with a sleek design that compliments any master bedroom and the use of eco-healthy materials with natural options available. This bassinet is heavy and lacks wheels making it a poor choice if you want an option you can move from room to room regularly and the higher price tag also makes it a poor choice for families on a tight budget. However, if your budget allows and your goal is an easy access co-sleeper you can't go wrong with the impressive babybay which is why it won an Editor's Choice award. The babybaby Bedside Sleeper is a cool co-sleeper that attaches to the parent bed but has design features in common with a traditional crib. In 2003, Christian Pihale's wife Ruth gave birth to two children back to back. Knowing she would have to get up throughout the night repeatedly, Ruth asked for help. Because traditional co-sleeping can be dangerous, Christian designed a solution for Ruth to keep the babies close so she could stay in bed and still meet their needs. Christian's vision became the babybay bedside sleeper answering the need for parents to keep their children close, safe, healthy, and happy. babybay® is an internationally best-selling product. This is a comparison of the overall scores for the bassinets we tested in this review including the top scoring babybay (blue) that won an Editor's Choice award. The sections below detail how the babybay performed in each metric during testing. The individual metric scores are used to calculate the overall score with emphasis given to the ease of use and breathability performance. The babybay isn't as easy to use as some of the competition thanks in part to its size and weight. The babybay earned a 6 of 10 for ease of use. Ease of use includes the features and functions you will use on a daily basis. This bassinet is very accessible even while you stay in bed. The product is designed to work with beds of various heights, and the lower side wall means getting baby in and out, or comforting baby while you rest, should be no problem. The product attaches to your bed via a flat portion (above left) on the opposite side of the parent bed connected to a long adjustable strap (above right) connected to the sides of the bassinet. The babybay is not designed for regular movement and is not a good choice if you plan to move your bassinet from room to room. babybay does offer optional casters that would make it significantly easier to move. This bassinet is one of the most substantial options we tested with a weight of 28 lbs and dimensions of 37.1"H x 36"L x 20.7"W. this unit is designed to be connected to your bed so it isn't portable and moving it from room to room would not be recommended. The heft and lack of folding also make it a poor option for travel. There are caster wheels available as an accessory which would make moving the babybay significantly easier, but the wheels would arguably be safer if you paired them with the conversion kit that turns the co-sleeper into a free-standing crib. The babybay has a height adjustment feature that is easy to move up or down with a screwdriver so it can be tailored to the height of the parent bed. The mattress platform is height adjustable, so you can choose a height that works best with your bed. It took almost 40 minutes to assemble this bassinet. It isn't difficult so much as the directions aren't useful. Upon investigation, the company offers a video tutorial, and we can see why. We didn't realize there are written instructions at the back of the manual because the first part is all pictures with no indication that it exists. This product wipes clean with a damp cloth. Nothing on this bassinet is machine washable, but the mattress pad can be hand washed. Given the wood slat design of the babybay, it has excellent breathability. The babybay earned a 10 of 10 for breathability. This unit is similar in design to a traditional crib, and unlike much of the competition that offers mesh sidewalls, this bassinet has wood slats with space between them. There is no fabric or issues that we can see to impair your baby's ability to breathe. The babybaby performed well in tests for sleep surface and it is the only bassinet with different mattress options. The babybay earned a 7 of 10 for the sleeping surface. This sleeping surface is very stable with no low points, but it is easy to compress and may offer less support than some of the competition. The babybay has the thickest mattress in the group (above left) with a slated bassinet bottom (above right). We can push our finger between the mattress and the wood slats, but the pad doesn't shift or move indicating a good fit. We tested the Classic mattress in this review. Babybay does offer five mattresses for different needs that are each slightly different in composition. The babybay is made with nice materials and a thoughtful design. The babybay earned a 10 of 10 for quality. It is easy to see the quality materials and designs when comparing this product against the competition. The wood is smooth and has accurate connection points without rough edges. The wood creates a sturdy, stable and durable product you can use for multiple children or sell when baby outgrows it. We love the overall fit and finish and feel like this bassinet is a real piece of furniture akin to a crib unlike some of the competition that feels like limited use products that aren't intended for the long haul. It is a simple, chic option that will compliment any decor. Parents can sleep with peace of mind knowing that babybay has taken eco-health into consideration in their material and construction choices. 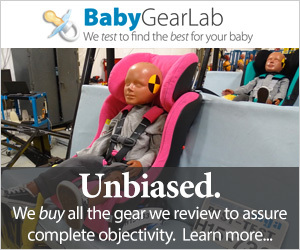 The babybay earned the highest score for eco-health with a 6 of 10 in a gear category where none of the bassinets impressed. babybay offers open transparency regarding the materials they use and their production process. We like that they provide an unfinished product with no MDF board to avoid most VOC emissions and they have organic mattress choices that use natural latex and coconut fiber instead of the more popular polyurethane. The other finishes use water-based products, avoidance of toxic fillers, and the mattresses use Oeko-Tex Standard 100 Class 1 materials. We purchased the Classic mattress for testing, as it is the base model and the least expensive making it a popular choice for parents and a way to keep costs down with this already higher priced option. This mattress is a polyurethane option which hurt its overall eco-health score as this kind of foam can off-gas. The babybay would have scored higher for this metric if the natural mattresses were standard or less expensive. However, that being said, this is arguably the best choice for parents concerned with toxic materials and potential off-gassing. babybay Cooling Comfort Jersey Sheet — This fitted cotton sheet is specifically designed for the babybay mattresses and is 100% cotton. This sheet is breathable, machine washer safe, and Certified baby-safe by the Oeko-Tex-Standard 100, Class 1 for Babies. It is a good idea to get two of these bad boys so clean up is quick and easy, even in the middle of the night. babybay Eco Comfort Mattress Pad — This mattress can be purchased as a bundle or separately. It is made of natural latex and coconut fibers and is wicking and breathable. This mattress has a zippered cover, is lightweight, free from hazardous chemicals, and certified baby-safe by the Oeko-Tex-Standard 100 Class 1 for Babies. babybay dry comfort mattress protector — This mattress protector is water resistant and is a must-have item for helping to keep your mattress clean. This cover closes with a zipper, is a cotton blend, machine washer safe, and certified by Oeko-Tex-Standard 100, Class 1 for Babies. babybay Bassinet Conversion Kit — This conversion kit works well with the rolling caster and turns your co-sleeper into a freestanding bassinet by turning the short side wall into a higher side wall. This kit comes with everything you need to use you babybay without attaching it to a full-size bed. babybay Rolling Casters — These rolling casters made specifically with the babybay in mind help turn your bassinet into a portable crib you can easily move from room to room or just across the room. Without them, the Babybay is simply too heavy and cumbersome for regular relocation. While babybay doesn't have other versions of bassinets, they do offer the Bedside Sleeper in different finishes and with the option of different mattress types. This al carte menu style of possibilities means parents can create the bassinet that best meets their needs and goals. We love this ability to create a bassinet as unique as your baby. The color options are untreated, light finish, white, walnut, and modern slate gray.